Not to be confused with Jim Hines. 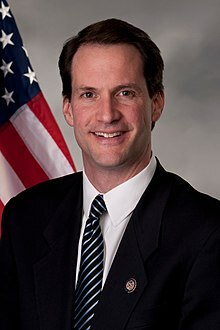 James Andrew Himes (born July 5, 1966) is an American businessman and U.S. Representative for Connecticut's 4th congressional district, serving since 2009. He is a member of the Democratic Party and Chairman of the New Democrat Coalition. The district includes most of the southwestern corner of the state and is largely coextensive with the Connecticut side of the New York metropolitan area. It incorporates portions of Fairfield and New Haven counties, including the cities of Bridgeport, Westport and Stamford. Himes was born July 5, 1966 in Lima, Peru, to American parents, where his father worked for the Ford Foundation. His father, James R. Himes, also worked for UNICEF, being the director of the UNICEF Innocenti Center, a research institute on child development in Florence, Italy. His mother, Judith A. Himes, was, until recent years, the director of board activities for the New Jersey Board of Higher Education in Trenton. He spent his early childhood in Lima and Bogotá, Colombia. After the divorce of his parents, Jim, his mother, and his two sisters moved to Pennington, New Jersey, where Himes attended and graduated from Hopewell Valley Central High School. Himes attended Harvard University as an undergraduate where he was the captain of the Lightweight crew and graduated with a Bachelor of Arts in 1988. Himes studied for a degree in Latin American studies as a Rhodes scholar at St Edmund Hall, Oxford and graduated with a Master of Philosophy in 1990. He was awarded an honorary Doctor of Humane Letters degree from the University of Bridgeport on May 5, 2012. In 1995, Himes began working at Goldman Sachs as a banker in Latin America and New York. He was eventually promoted to vice president. In 2003, Himes began working for the non-profit Enterprise Foundation (currently Enterprise Community Partners), and later began running its metropolitan New York operations. In 2007, he was named vice president of Enterprise. Himes was appointed a Commissioner of the Greenwich Housing Authority in 2002, and served for two years as chairman of the board. He has also served as a board member of Aspira of Connecticut in Bridgeport, a board member of the Fairfield County Community Foundation, and as an advisory board member of Family Assets, LLP of Bridgeport. He was also an elected member of the Greenwich Board of Estimate and Taxation and served as the Chairman of the Greenwich Democratic Town Committee. H.R. 2600, a bill to prohibit any state from imposing income taxes on nonresident individuals for any period in which the individual is not physically present in or working in the state, introduced May 21, 2009, reintroduced in the 112th Congress as H.R. 5615, reintroduced in the 113th Congress as H.R. 4085. H.R. 3973, a bill to award competitive grants to school systems that are implementing innovative early-education curricula, introduced October 29, 2009. Himes introduced a similar bill in the 112th Congress as H.R. 3322 and two similar bills in the 113th Congress as H.R. 3983 and H.R. 3984. H.R. 4106, a bill to create a grant and loan program for retrofitting homes with renewable energy technology, introduced November 18, 2009. H.R. 5779, a bill to terminate and reduce payments for various agricultural programs, introduced July 20, 2010. H.R. 1965, a bill to increase from $1 to $10 the shareholder registration threshold for issuing securities, and to require any bank or bank holding company to register with the U.S. Securities and Exchange Commission if its assets exceed $10 million and include a certain class of equity security held of record by 2,000 or more people, introduced May 24, 2011. H.R. 1965 has passed the House of Representatives but has yet to become law. H.R. 3283, a bill to exempt from regulation under Title VII of the Dodd–Frank Wall Street Reform and Consumer Protection Act (WSTAA) any swap dealers who are either a U.S. corporation or a subsidiary of a U.S. corporation and report such swaps to a swap data repository registered with the Commodity Futures Trading Commission (CFTC), to subject swap dealers to any regulations established by the CFTC to prevent evasion of WSTAA requirements, and subjects to WSTAA requirements any non-U.S. swap dealer who engages in swaps with any U.S. corporation, introduced October 31, 2011. H.R. 6187, a bill to increase efforts to cure HIV/AIDS, introduced June 25, 2012, reintroduced in the 113th Congress as H.R. 3630. Planned Parenthood gives Himes a 100% pro-choice rating. He voted against the Stupak-Pitts Amendment in the Affordable Health Care for America Act that was intended to prevent any federal funds from paying for any health care plan with abortion coverage. Himes states that "we should reduce our presence in Afghanistan as rapidly as possible and reshape our mission to focus exclusively on counterterrorism", yet requiring "presence in the region, but one considerably smaller than that required by our present strategy of nation-building." He believes in a world free of nuclear weapons, and readily supports sanctions against Iran. He voted for the Comprehensive Iran Sanctions, Accountability, and Divestment Act of 2010. He supports a two-state solution between Israel and Palestine. Himes believes that early childhood education is "the most intelligent investment a nation can make in its future," and voted to double funding for Early Head Start Program. He stated in 2008 that No Child Left Behind "is well-intentioned because it focuses on education, but it must be reformed." Himes also co-authored an amendment to the Student Aid and Fiscal Responsibility Act that promoted the financial literacy of students. Environment America has given Himes a 100% rating. He believes that "By creating the right set of financial incentives and supporting a broad range of research and development, we can deliver the energy our economy requires to thrive while protecting our planet." He also voted for the American Clean Energy and Security Act. Himes is the chair of the New Democrat Coalition ("New Dems"), a group of business-centric Democrats. The New Dem PAC, which has worked to recruit more moderate Democrats as candidates for Congress this year, receives significant funding from the banking industry. (https://newdemocratcoalition-himes.house.gov/about-us/our-agenda). In May 2018, Himes (a former Goldman Sachs employee and member of the Financial Services Committee) voted with house republicans to fulfill Trump's campaign promise to roll back Obama era protections put in place to prevent another financial meltdown. Economic Growth, Regulatory Relief and Consumer Protection Act, known as the Crapo bill for its primary sponsor, Mike Crapo, a Republican senator from Idaho freed thousands of banks with less than $250 billion in assets from stricter federal oversight. (https://www.congress.gov/bill/115th-congress/senate-bill/2155). Critics of Himes, who's biggest campaign contributors come from the Securities & Investment and Insurance industries (https://www.opensecrets.org/members-of-congress/summary?cid=N00029070), say his vote guts consumer protections and increases the risk of another financial crisis. Foreign banks that pose major risks, such as the Trump-friendly Deutsche Bank, will see their United States subsidiaries deregulated. Himes' district include Greenwich, CT, home to many large Hedge Funds and financial services employees. At the bill-signing ceremony, Trump praised democrats' support stating, “Dodd-Frank was something they said could not be touched and, honestly, a lot of great Democrats knew that it had to be done,” he said. On March 6, 2013, Himes co-sponsored H.R. 992  which rolls back provisions in section 716 of the Dodd-Frank Wall Street Reform and Consumer Protection Act. Citigroup's recommendations were reflected in more than 70 lines of the House Financial Services committee's 85-line bill. Two crucial paragraphs, prepared by Citigroup in conjunction with other Wall Street banks, were copied nearly word for word. According to the Congressional Budget Office "H.R. 992 would allow certain financial firms to retain financial portfolios containing swaps while remaining eligible for assistance from the Federal Reserve and Federal Deposit Insurance Corporation (FDIC)." Himes vorted for H.R. 922., the Swaps Regulatory Improvement Act. He also voted for H.R. 2374, the Retail Investor Protection Act. Himes voted against H.R. 627 which allowed loaded guns into national parks. The Brady Campaign to Prevent Gun Violence gives him a 100% lifetime score for his support of more gun regulations. Himes supports the Patient Protection and Affordable Care Act. He believes in preserving Medicare and Medicaid and says we must be "prepared to equitably reform these programs to address the challenging problem of rising health care costs and ensure that these important safety net programs are here to help this generation and the next." Himes voted against H.R. 2397 which was to defund the NSA domestic phone metadata spying program. As one who is against the NSA's metadata spying program, Himes states that he voted against H.R. 2397 not because he objects to the principle of limiting the NSA's power, but because the bill was created in a reactionary manner and stripped the NSA of too much power. Himes co-sponsored H.R. 402, The National Infrastructure Development Bank Act of 2011, which would objectively fund national infrastructure projects. According to Himes, it would also "attract private investment and facilitate private sector partnering with regions, states and localities to borrow from the Bank while adding its own private equity to projects." He has helped bring money to the 4th district, such as "over $70 million for safety improvements, resurfacing, enhancements, and bridge improvements to the Merritt Parkway; over $11 million for infrastructure improvements at the Steel Point project in Bridgeport that will generate thousands of new jobs; and $30 million for upgrades to Metro North’s Danbury Branch line." In 2009-2010, the Society for Animal Protective legislation gave Himes a rating of 100% for his support of animal protection. In 2009, Himes was given a rating of 100% by the Defenders of Wildlife Action Fund for his position on wildlife action. In 2009-2010, the Human Rights Campaign gave Himes a rating of 100%. In 2009-2010, the American Immigration Lawyers Association gave Himes a rating of 100% for his stance on the defense of undocumented immigrants in the U.S.
Himes lobbied the Electoral College to refuse to vote for Donald Trump and to instead elect Hillary Clinton. On December 12, 2016, in an interview on CNN's New Day, he said that he was troubled by several actions by the president-elect. The issue that "pushed me over the edge" was Trump's criticism of the CIA and the intelligence community. The Congressman did admit that Trump won "fair and square," but he said that Trump proved himself unfit for public office. He cited the intentions behind the creation of the electoral college and he argued that it was created for an instance such as the election of Trump. Himes faced the ten-term Republican incumbent Chris Shays in the 2008 congressional election, along with Libertarian nominee M.A. Carrano, a professional philosophy writer and systems consultant, and Green Party nominee Richard Duffee. Winning by a margin of 51 percent to 47 percent, While Shays won 14 of the district's 17 towns, Himes won all three of the district's large cities—Bridgeport, Norwalk and Stamford. Ultimately, he owed his victory to swamping Shays in Bridgeport, winning a staggering 80 percent of the vote there. He was also helped by Barack Obama's massive win in that district; Obama carried the 4th with 60 percent of the vote, one of the largest margins Obama recorded in a Republican-held district. Himes took office in the 111th United States Congress on January 6, 2009. He is the first Democrat to represent the district since Donald J. Irwin left office in 1969, and only the second since 1943. Shays was the sole Republican congressman from New England, and Himes's win made New England's House delegation entirely Democratic for the first time in history. In the 2010 election, Himes won reelection against Republican challenger State Senator Dan Debicella. Along with the three towns that he won in 2008, Himes also won Redding, Weston, and Westport, and won Fairfield by nine votes. The campaign raised $3,660,497.57, $3,603,727 of which was spent. Only 4% of that came from small individual donors, while 60% came from large individual donors. The remaining donations came mostly from Political Action Committees (34%). Himes did not self-finance at all. The majority of his money, 74%, came from in-state. Only 26% came from out of state. Rep. Himes disclosed 97.9% of his donations. On October 16, 1994, he married Mary Linley Scott, of Toronto, a daughter of Janet and Michael Scott. The ceremony took place at Cathedral Church of St. James in Toronto, Ontario, Canada, and was performed by the Rev. M. Jane Watanabe, an Anglican associate priest. His wife was an assistant designer at Dorf Associates, a retail design firm in New York. She graduated from McGill University and from the Parsons School of Design. Her father retired as the vice chairman of Scotia McLeod, an investment bank in Toronto. Himes lives in the Cos Cob section of Greenwich with his wife and their two daughters: Emma and Linley. His daughter Emma attends the University of Pennsylvania. He is fluent in Spanish. He is also a Member of Session of the First Presbyterian Church of Greenwich. "Members". New Democrat Coalition. Retrieved 2 February 2018. "Himes, James A." Biographical Directory of the United States Congress. Retrieved 2009-04-19. Halbfinger, David M. (2008-11-09). "'Bullheaded' and a Rhodes Scholar, and Now Headed to Capitol Hill". The New York Times. Retrieved 2009-04-19. "Congressman Jim Himes : Biography". Archived from the original on 2010-12-12. Retrieved 2010-11-05. "WEDDINGS; Mary L. Scott, James A. Himes". The New York Times. Retrieved 2018-09-27. "Himes Reaches Out to War-Weary Republicans" Archived 2010-10-21 at the Wayback Machine., Jim Himes for Congress. Accessed February 15, 2011. "He was raised by "a working single mom" in the small town of Pennington, N.J., and attended 'a decent public school.' When he brought home an A minus, his mother would ask, 'What went wrong?'" "Rep. Jim Himes, D-CT, to address graduates at University of Bridgeport's 102nd Commencement on May 5". Archived from the original on 2012-05-12. Retrieved 2017-04-22. "Representative Himes's Legislation". Library of Congress. Retrieved December 5, 2014. "Membership". Congressional Arts Caucus. Retrieved 13 March 2018. "Members". Congressional NextGen 9-1-1 Caucus. Retrieved 11 June 2018. "90 Current Climate Solutions Caucus Members". Citizen´s Climate Lobby. Retrieved 20 October 2018. "Members". U.S. - Japan Caucus. Retrieved 11 December 2018. "Planned Parenthood Action". Archived from the original on 2011-10-20. Retrieved 2012-05-03. Rep. Himes' Platform: Defense Archived 2011-10-28 at the Wayback Machine. Rep. Himes' Platform: Education Archived 2011-10-28 at the Wayback Machine. Rep. Himes' Platform: Energy and Environment Archived 2011-10-28 at the Wayback Machine. Lipton, Eric; Protess, Ben (May 23, 2013). "Banks' Lobbyists Help in Drafting Financial Bills". The New York Times. "H.R. 992, Swaps Regulatory Improvement Act - CBO". Cbo.gov. 2013-05-20. Retrieved 2014-08-18. "H.R.2374 - 113th Congress (2013-2014): Retail Investor Protection Act | Congress.gov | Library of Congress". Beta.congress.gov. Retrieved 2014-08-18. Rep. Himes' Platform: Health Care Archived 2011-10-28 at the Wayback Machine. "Rep. Himes' Platform: Transportation". Archived from the original on 2011-10-28. Retrieved 2011-11-20. "Jim Himes' Ratings and Endorsements - Project Vote Smart". Votesmart.org. Retrieved 2014-08-18. Jon Lender & Mark Pazniokas (November 5, 2008). "Jim Himes Defeats Christopher Shays in 4th District". The Hartford Courant. Retrieved April 18, 2014. "Weddings | Mary L. Scott, James A. Himes". New York Times. October 16, 1994. "Meet Jim". Archived from the original on March 5, 2008. Retrieved March 6, 2008.